A wetland site of roughly 20 hectares, Glen Moss lies in a natural hollow in the hills about a quarter-of-a-mile east of Kilmacolm. 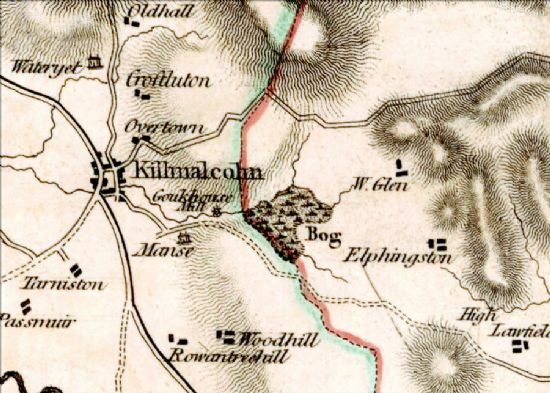 The site first appears on a 2 inch-to-the-mile map by John Ainslie published in 1796. An area is marked as ‘bog’ and there is a mill called Gowkhouse on the outflow from the wet area. On the first edition Ordnance Survey maps produced in the 1860s the site is marked as ‘rough pasture’ with no open water marked. 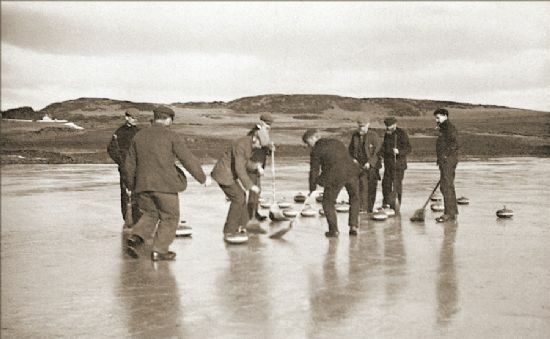 By the 1890s the recently formed Kilmacolm Curling Club had introduced a sluice at the south-west corner on the only outflow from the site. The sluice was used to flood the site in the autumn for winter curling and skating activities. Although Glen Moss was drained in the spring to regain some of the rough pasture land, the sluice raised the overall water-table. This resulted in a wetter habitat and many marsh and water plants soon colonised the area. 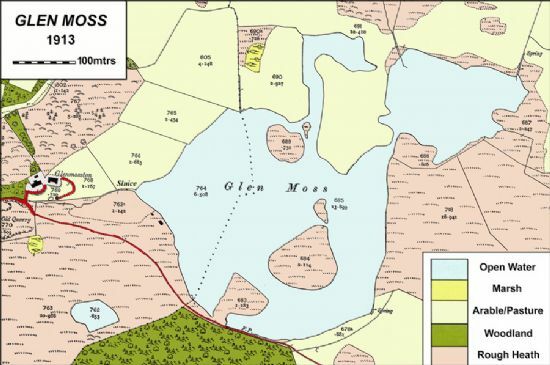 Today, the Glen Moss area is best described as a mixed basin and valley mire with an area of shallow open water surrounded by sedge-dominated plant com-munities. 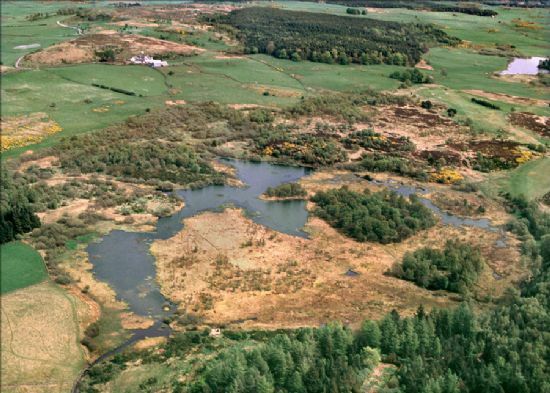 Such a naturally occurring and relatively undisturbed wetland habitat is uncommon and in 1973 Glen Moss was given a degree of legal protection by being designated as a Site of Special Scientific Interest (S.S.S.I.). In 1991 the Scottish Wildlife Trust negotiated with local landowners the right to treat the southern area of Glen Moss as a Nature Reserve. 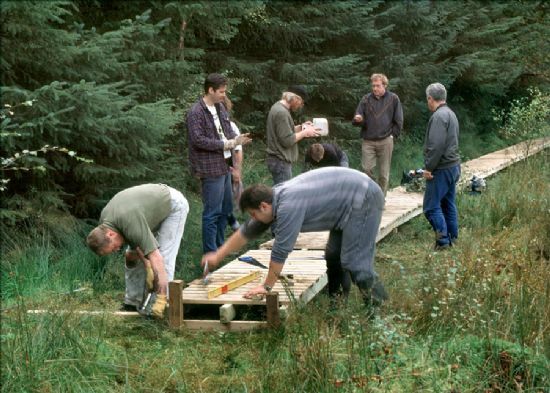 To assist open access to the site by the public, the Scottish Wildlife Trust has put in place a series of paths and boardwalks. The marsh is situated in the Renfrewshire Heights in Inverclyde/Renfrewshire districts at an altitude of 150 metres above sea level. During the Ice Ages, glaciers moved east-south-east across the area and gouged out the softer rocks to form a shallow glacial lake. The underlying basalts are impermeable and this has resulted in Glen Moss being a marshy wetland for many centuries. Springs to the north and east issue into the area providing a throughput of freshwater. The wide range of habitats found throughout the S.S.S.I. 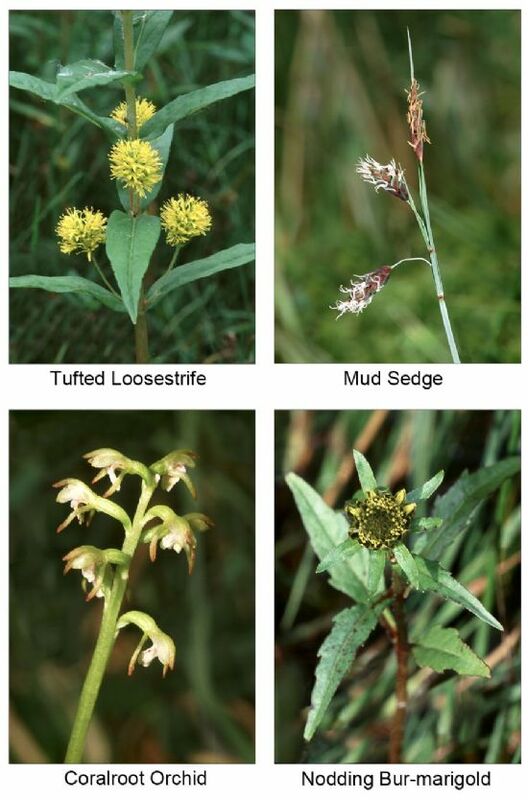 has resulted in a list of over 200 different plants - a number of which are locally rare wetland species. Examples include the northern loosestrife and mud sedge which grow through-out the marshy parts of the site. The inconspicuous coralroot orchid may be found growing through the carpets of moss under willow scrub which surrounds the Moss. 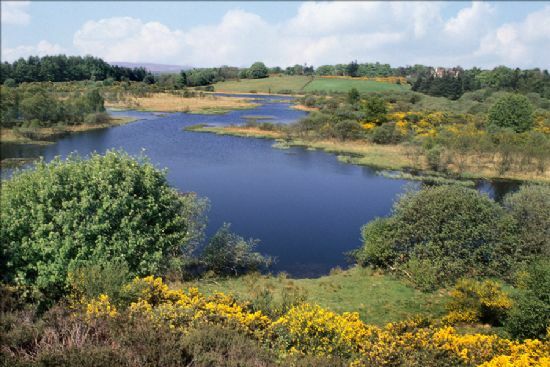 In springtime flowering broom and gorse add a vibrant splash of yellow to the surrounding area and rafts of pink-flowering bog bean brighten the open water. In summer the white tufts of bog-cotton seed-heads waft in the breeze and in autumn the dying flowers of bog asphodel impart a brilliant reddish colour to the marsh. Four types of dragonfly and five types of damselfly breed at the reserve. This makes Glen Moss a very important site for these insects. 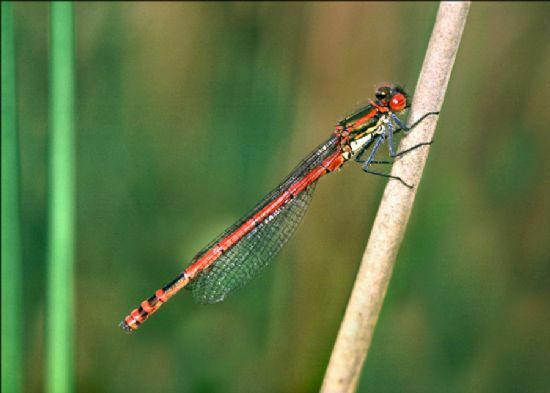 The first to emerge around late April is the large red damselfly followed in May by the four-spotted chaser dragonfly along with the common blue damselfly. During the month of July other types of dragonflies emerge from the boggy pools. Common and black darters make an appearance including the emerald and blue-tailed damselflies. 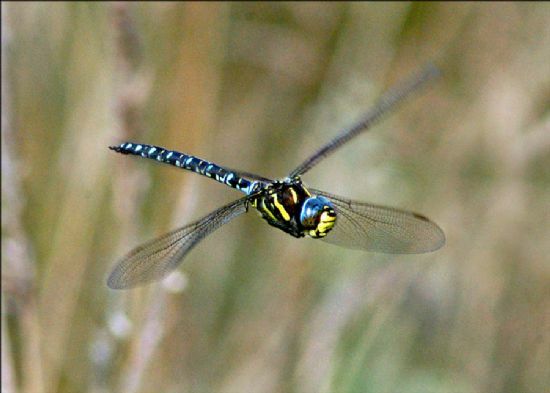 The most spectacular dragonfly to look out for is the common hawker which is about 10cm (4 inches) from wing tip to wing tip. Despite its large size this insect is completely harmless and cannot sting or bite people. All of these insects catch and eat smaller insects. In summer butterflies abound at the edges of the marsh. 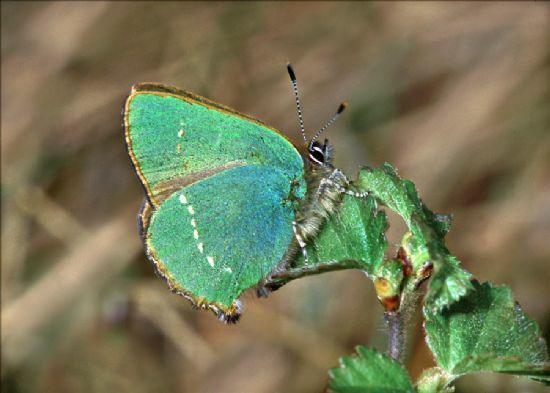 The first to emerge in early May is the green hairstreak. This small insect is easily overlooked but is worth watching for. 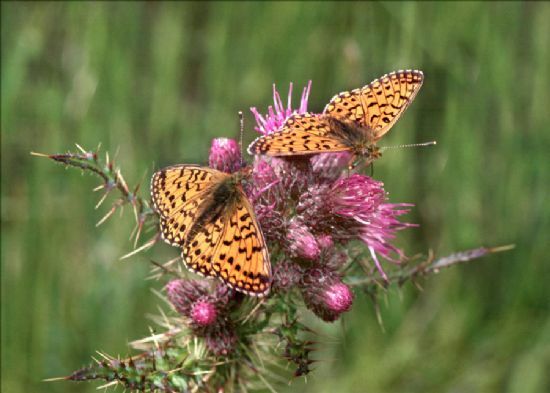 Come June and July the beautiful orange-coloured small pearl-bordered fritillary may be seen feeding on the opening flowers of the marsh thistles. Brown coloured ringlets, a recent arrival at Glen Moss, and meadow browns flit through the grassy areas to the sound of willow warblers and reed buntings which sing throughout Glen Moss. 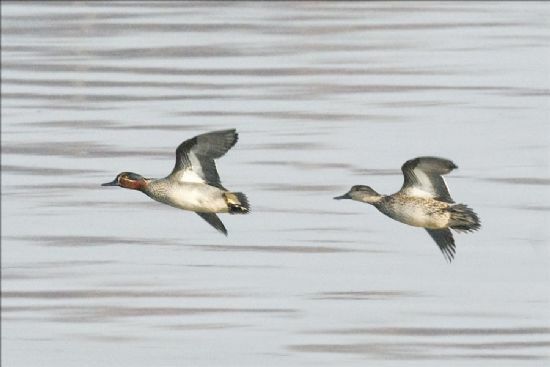 In winter the marsh is silent except for the tinkling call of teal duck as they flight round the site. 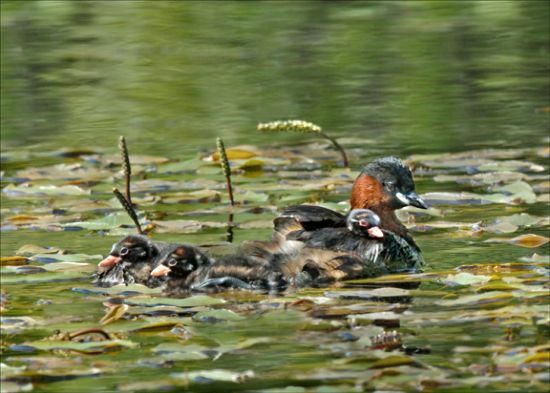 Tufted duck, wigeon, goldeneye and goosander are often seen resting and feeding at the edge of the open water. Unlike many urban nature reserves, Glen Moss has something for everyone. For the botanist there are many uncommon wetland plants. The insect lover can marvel at the agility of nine species of breeding dragonflies and look out for over eight species of breeding butterflies. Hoverflies and bumblebees abound during the summer months. The casual dog-walker can enjoy panoramic views across the marsh. For all visitors there is a tranquillity which soothes the soul - well worth a visit!. McGill’s City Connect Route x7 from Glasgow to Kilmacolm via Braehead. Take the A761 from Paisley to Kilmacolm Cross. Left into St James Terrace and left into CAR PARK. Walk across Bridge of Weir Rd into Moss Rd and then right into Gillburn Road. Right into Gowkhouse Rd and proceed uphill on unsurfaced Gowkhouse Lane. Follow lane up to Glenmoston Rd and enter the SWT Glen Moss Reserve along the signposted right-of-way.